There are countless ways to celebrate National Quilting Day. Mountain Heritage Quilters Guild from Fairmont, West Virginia celebrates this special day by contacting Fairmont Regional Hospital and making arrangements to donate a baby quilt to the first baby born during National Quilting Day. 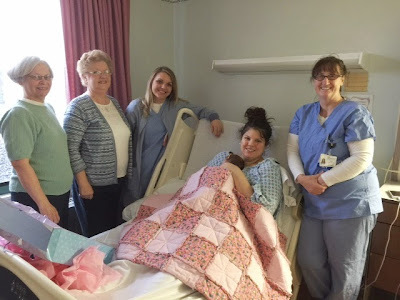 Mountain Heritage Quilters Guild of Marion County were anxiously awaiting the arrival of a "Quilt Baby" to gift a beautiful handmade baby quilt to the first newborn at Fairmont Regional Hospital. 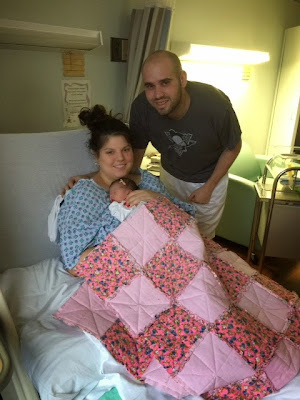 The call everyone was waiting for came through and word quickly spread ... "We have a Quilt Baby – it’s a GIRL!!!!" Ann Bratton, Barbara Mullenax, and Sally Wilhelm represented Mountain Heritage Quilters Guild in making the presentation to the new baby and parents. Quilt Baby 2015 is Audra Rae Rogers and was born weighing in at 6 lbs 14 oz. Her parents are Amanda and Josh Rogers from Monongah. Amanda is a nurse at Fairmont Regional Hospital. This special day to celebrate quilters and quilting makes everyone "sew happy." To learn more about Mountain Heritage Quilters Guild visit their website at: home | mountainheritagequiltersguild or contact the YWCA and Bob at 304-366-4480. Mountain Heritage Quilters Guild of Marion County were like anxious parents awaiting the arrival of a "Quilt Day Baby" to gift a beautiful handmade baby quilt to the first newborn at Fairmont General Hospital on March 15th as they began their celebration of National Quilting Day. & Week. The call everyone was waiting for came late afternoon on Saturday ... "We have a Quilt Baby!" This special day to celebrate quilters and quilting makes everyone "sew happy." National Quilting Day is the opportunity to reflect on traditions of quilt making and the contributions quilters continue to make with their families and community throughout the generations. Baby Arayah was born on March 15, 2014, at Fairmont General Hospital -- just in time for National Quilting Day! Representing Mountain Heritage Quilters Guild, members Marling Imes and Barbara Mullenax presented "Quilt Baby Arayah" with a handmade baby quilt from the Guild. Arayah is the daughter of William and Alicia Holt of Bridgeport. She has 4 brothers and a sister waiting for her at home. Congratulations Arayah and parents for participating in National Quilting Day along with Mountain Heritage Quilters Guild. For additional information about Mountain Heritage Quilters Guild, please visit their website at mountainheritagequiltersguild. You may also contact Bob at the YWCA 304-366-4007. FAIRMONT — The Mountain Heritage Quilters Guild of Marion County shared their love of quilting by reaching out to the HOPE Inc. community through their second annual service and charity project. The second service project completed by guild members was Project Pillowcase to support the Marion County HOPE Inc. agency. Members of the guild made and donated a total of 82 colorful pillowcases. Many mothers and children will be comforted by receiving one of these lovely pillowcases made especially for them. This service Project and charity have been selected to be registered with the national project of One Million Pillowcase Challenge Team at www.allpeoplequilt. com/millionpillowcases and entered into the Pillowcase Counter recognizing both the guild and the chosen charity. Service projects are a huge undertaking by guild members and very rewarding — what a wonderful way to share energy, skill and materials! Many community service organizations benefit from the generosity of members. During the April Guild monthly meeting, guild members welcomedMary Hall, HOPE Inc. representative. She shared a brochure and information about their Domestic Violence and Sexual Assault support services and HOPE’s history in Marion County. HOPE Inc. is a private, nonprofit, charitable United Way agency offering shelter and confidential supportive services to victims of sexual assault or domestic violence and their families. Professional staff and trained advocates provide information, make referrals, discuss alternative, and provide emotional support. The West Virginia Executive Director is Harriet Sutton. HOPE may be reached at 304-367-1100. Barbara Mullenax (right), representative of Mountain Heritage Quilters, presents Mary Hall, HOPE Inc. representative, with a donation of 82 pillowcases to benefit the program from a guild service project. Sesquicentennial quilt depicts stories from each county in W.Va.
Lynda Sagoʼs Forget Me Knot quilt pattern, which is part of a sesquicentennial quilt on display at the Culture Center in Charleston, represents the histo­ry of Marion County and Julia Pierpontʼs contributions to the establishment of Memorial Day. The Culture Center, located at the State Capitol Complex in Charleston, is featuring a new quilt display that commemo­rates West Virginias 150th birth­day. A sesquicentennial quilt, made of individual squares that represent and depict the stories of each of West Virginias 55 counties, hangs in the exhibit for visitors to admire. We have such a rich tradition of quilting, said Renee Margocee, interim arts director for the West Virginia Division of Culture and History. Nationwide, West Virginia is associated with quilting, so we wanted to showcase a traditional art form that has been a part of the state from its very beginning. Margocee said quilters from each county were chosen to sew squares that would later be pieced together to form the finished product. Lynda Sago, of Fairmont, created Marion Countys quilt block. Sago said her grandmother inspired her to take up quilting. My quilting background begins with fond memories of my grand­mother, Georgia Hayhurst, setting up her quilting frames on the porch of her log home, Sago said. Neighbors and relatives would hear the news and soon bring their thimbles to her old-fashioned quilt­ing bee. From there, Sagos passion for the art form only grew. I love hand quilting, Civil War reproduction fabrics, vintage button and traveling with friends to quilt shows and shops, she said. FAIRMONT — The Mountain Heritage Quilters Guild of Marion County celebrated its 25th birthday in July 2012. Members of the Mountain Heritage Quilters Guild choose each year to share their love of quilting by reaching out to the community through service and charity projects. The first service project for 2012 completed by guild members was Project Placemats to support the Marion County Meals on Wheels organization. Members of the guild made and donated a total of 86 quiltedplacemats. Many people will be comforted by receiving one of these beautiful quilted placemats. Service projects are a huge undertaking by guild members and very rewarding … what a wonderful way to share energy, skills, and materials. Many community service organizations benefit from the generosity of members. During the October guild monthly meeting, members welcomed Lucy Eates, Meals on Wheels volunteer who has been with the program since its beginning in 1973. She shared information about the “Meals” program and its history in Marion County. Meals on Wheels, Inc. will celebrate its 40th year of service at its May 2013 annual Appreciation Dinner. At its inception, 14 meals were delivered daily from Fairmont General Hospital, and today approximately 60 daily meals go out of Fairmont General and the John Manchin Sr. Health Care Center. The meals go to the elderly, housebound, and those unable to shop or properly prepare food for themselves, allowing them to remain independent in their homes. Funding for the program comes from client payments, personal donations, church and social service donations, memorials and bequests. Meals on Wheels Inc. volunteer drivers will be delivering the placemats to the clients in time for the upcoming holiday season. Clients appreciate being remembered by community groups at any time. The Mountain Heritage Quilters Guild meets the second Friday of each month at 6:30 p.m., YWCA, 2019 Pleasant Valley Road. They welcome quilters of all experience levels to join them, even if you are not a quilter and would like to become one. For more information about becoming a member of the Mountain Heritage Quilters Guild, please contact the YWCA. During the October Mountain Heritage Quilters Guild monthly meeting, members welcomed Lucy Eates, Meals on Wheels volunteer who has been with the program since its beginning in 1973. She shared information about the “Meals” program and its history in Marion County. Eates is shown accepting a donation of 86 colorful quilted placemats on behalf of the “Meals” program from guild treasurer Martha Law.